There was a time when the idea of reaching for the stars was a goal that was being pursued literally. It filled us with pride, enthusiasm and a spirit of adventure. It’s also something we seem to have lost in the years since then. 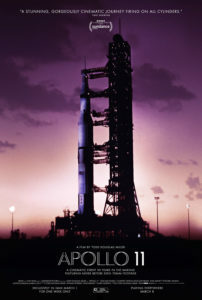 Thankfully, though, there’s a new documentary that reminds us of that time, reigniting those feelings, at least for the time we’re seated in the movie theater, the stirring account of a truly historic space flight, “Apollo 11” (web site, trailer). In 1961, when President John F. Kennedy proposed the goal of sending a man to the moon and safely returning him to the Earth, the nation zealously rallied behind this ambitious initiative in a way rarely seen in the country’s history. It was looked upon as an enormous challenge, one full of unknowns and risks. But it was embraced with tremendous enthusiasm and an irrepressible “can do” attitude. And, after years of effort, determination and sacrifice, that noble prospect was about to be realized in 1969 with the historic launch of the Apollo 11 mission. 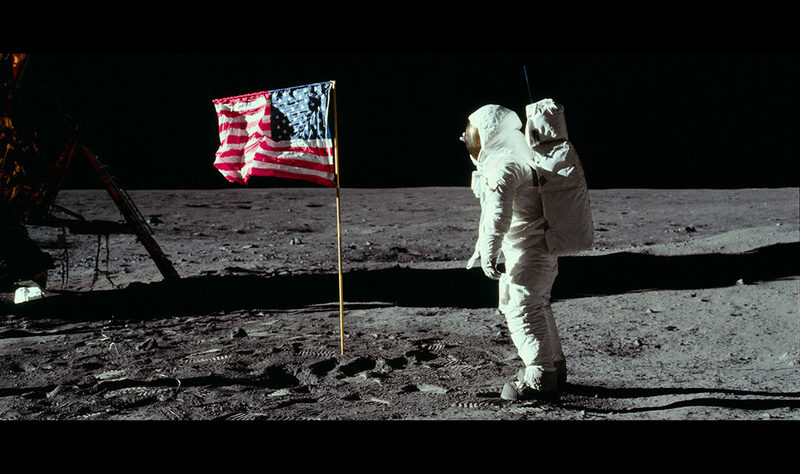 In July of that year, astronauts Neil Armstrong, Buzz Aldrin and Michael Collins embarked on their epic journey, backed by an army of flight engineers and technical and support staff, along with the collective encouragement of the American people and the citizens of the world. The pre-launch fervor was palpable and infectious. The fate of the intrepid trio was on everyone’s mind, with countless spectators assembled at the Kennedy Space Center and in front of their TV sets to witness the much-anticipated start of this incredible expedition, arguably the most significant event in the history of mankind. 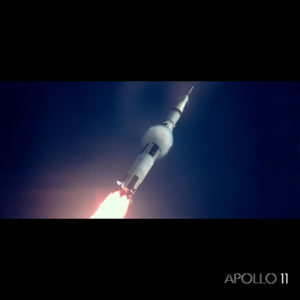 As it lifts off from the Kennedy Space Center, the Saturn V rocket carrying the crew of the first manned mission to the moon soars into the heavens as seen in the excellent new documentary, “Apollo 11.” Photo courtesy of Neon. Amidst great fanfare and set against the backdrop of a pristine azure sky on July 16, the enormous Saturn V rocket carrying the Apollo 11 crew blasted off into the cosmos. Onlookers stared in awe as the craft soared into the heavens. Thus began the heroic saga that a generation had awaited, its fulfillment nearly at hand. Over the next four days, Apollo 11 made its way toward a rendezvous with its destiny. On July 20, the Eagle lunar lander separated from the spacecraft’s command module for its descent to the moon, where astronauts Armstrong and Aldrin took humanity’s first steps onto the surface of another world, truly a giant leap for mankind. This remarkable documentary chronicles the moment-by-moment events that made up this legendary mission. Relying only on footage and audio recordings from the time, the film shows viewers what happened exclusively through the accounts of witnesses to the saga. Some of these materials will no doubt appear familiar, but others present details less known or not seen before. 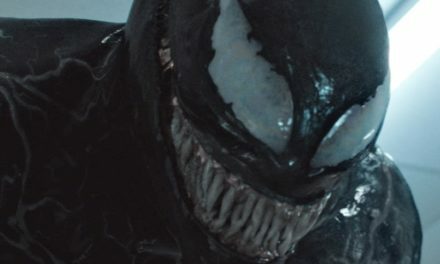 But, as impressive as this film is, what’s equally extraordinary is what’s shown and not told – the boundless captivation associated with this grand undertaking. 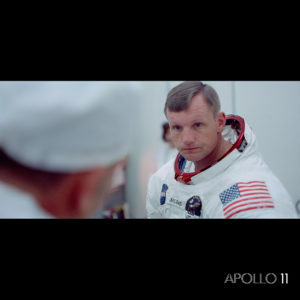 Astronaut Neil Armstrong prepares for his epic journey to the moon in the superb new documentary of this historic event, “Apollo 11.” Photo courtesy of Neon. “Apollo 11” depicts this venture as the great endeavor it truly was, one whose occurrence resulted from an unparalleled effort by those directly involved in it and those who lent their backing to see it happen. This collectively inspired and manifested event is, arguably, the pinnacle of mankind’s accomplishments. It’s also a shining example of what we as a species are capable of when we pool our resources, both materially and energetically. Given the magnitude of this mission and the larger program of which it was a part, it’s indeed remarkable to see what was accomplished, especially in light of the limited and far less sophisticated technology of the time. However, what’s even more astonishing is that this tremendous attainment originated with an idea, an intangible notion far removed from its tangible fulfillment. Were this principle to be employed routinely and jointly, it could be used to solve the world’s problems and create grand new conceptions, leading us to other accomplishments as enviable as any footstep taken on the lunar surface. As noted before, though, the most significant element that made this venture work was everyone pulling together as a team. Having a collective goal can work wonders in uniting people, bringing them together for a jointly shared vision. Landing a man on the moon was perhaps one of the greatest examples of such a grand pooling of efforts. For those of us old enough to remember that time, it was something in which we all took pride, the kind of mutual undertaking we haven’t seen since – and that we could use today. Initiatives like building a border wall just aren’t in the same league as something as adventurous as planting ourselves on another world. 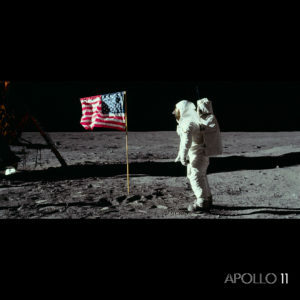 Standing on the surface of the moon, astronaut Neil Armstrong takes in the magnitude of this giant leap for mankind in the riveting new documentary, “Apollo 11.” Photo courtesy of Neon. This expertly crafted account of this epic mission is quite a film. 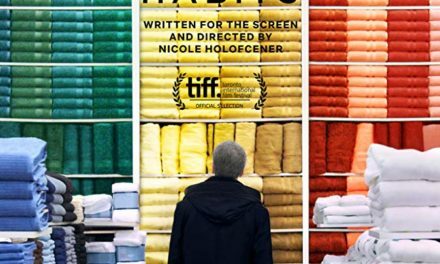 It effectively captures the look and feel not only of the event, but also of the times in which it took place, effectively evoking feelings that are both nostalgic and prideful. It reminds viewers of a time when the country truly was great and its people had something to believe in, words to the wise for those of us living in a time that’s a mere shadow of what it once was. Inspiration can be a tremendous motivator. Let’s hope that the encouraging example set in “Apollo 11” helps to restore those feelings, emboldening us to think, live and believe audaciously once again. And, this time, maybe we’ll reach those stars after all. When confronted with difficult situations, most of us probably do our level best to do the right thing. Were we to do otherwise, we’d likely have trouble living with ourselves, so earnestly taking steps to accommodate the circumstances often comes naturally, almost like a knee-jerk reaction. But what do we do when we’re faced with something particularly troubling, a scenario in which we’re up against seemingly impossible odds? 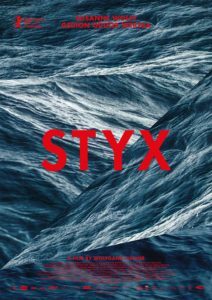 Such circumstances push us to take a hard look at ourselves to see just how far we’ll go, a conundrum faced by a woman with her back against the wall in the new high seas drama, “Styx” (web site, trailer). This multifaceted saga most obviously involves the fate of the refugees, but there are other aspects of this tale that are just as important, even if not as plainly apparent. Where the primary story thread is concerned, there are multiple outlooks in play – those of the authorities, whose concern is questionable at best, those of Rieke, which are clearly driven by compassion, and those of the refugees, who are ostensibly testing the character of their would-be rescuers. Resolution will depend on which outlooks hold sway, a circumstance that fundamentally means multiple outcomes are ultimately possible, for better or worse. Based on the conversations and events here, sadly, the attitudes of officialdom are quite telling. The authorities are only too willing to assist an affluent White European woman but unconcerned in coming to the aid of a group of Black African refugees, women and children included. Politically correct rhetoric and pronouncements aside, the actions of officials here thus speak volumes about what their real views are. But this question is not the only issue put to the test in this situation. Rieke’s personal character is challenged by what’s unfolding around her, forcing her into addressing issues like transformation, innovation, sacrifice and salvation, both for those she’s trying to help as well as for herself. She’s in a very fluid situation as she assesses the conditions and attempts to come up with solutions for attending to them. It not only calls forth traits she already possesses, but it also pushes the emergence of others, including some of which she may have previously been unaware, enabling her to evolve in ways she may not have envisioned when she embarked on her journey. She may find that surprising. 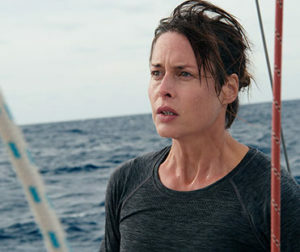 But, then, given her projected destination – Ascension Island, a locale distinguished by its own exploration of the concept of evolution – her character-testing experience with the refugees is an ironically fitting reflection of that idea where she’s concerned personally.